"I designed these beaded stretch bracelets for men to treasure spiritual peace," confides Andrea Tejeda. 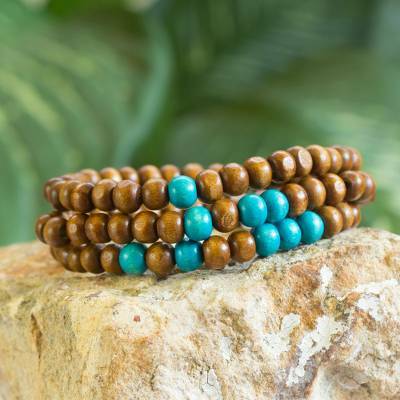 She threads the brown and turquoise pinewood beads on clear elastic threads, creating a handsome set of three bracelets. You can find men's wood beaded bracelets 'Brown Spirituality' (set of 3) by Andrea Tejeda in jewelry categories such as No Stone Bracelets, Wood Bracelets, Beaded Bracelets and Stretch Bracelets. Enjoy exploring these sections for other Novica treasures. I really like them.Fit is great.?? ?